Good design is about finding solutions. »A designer’s designer. An architect in paper.« The Japanese-American designer Tomoko Miho was a dedicated modernist. Influenced by her Japanese background she applied spatial solutions to printed matter. Nothing followed a standard format. Tomoko Miho (1931–2012) began her award winning career in the early 1960s. She worked for design firms as George Nelson and the Center for Advanced Research in Design until she established her own design firm in New York in 1982. Her broad range of work covers corporate identities, architectural signage, environmental graphics, book and brochure design. In 1993 she received AIGA’s Gold Medal in recognition of her entire career. 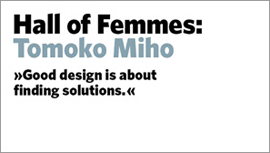 Hall of Femmes: Tomoko Miho includes an introductionary essay by Véronique Vienne, art director, design critic and writer. It is richly illustrated, much of it never before published.